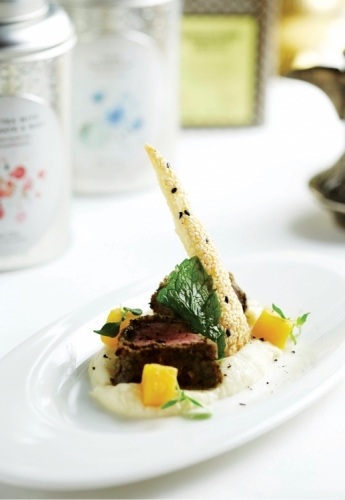 Sous-vide Lamb loin marinated with Dilmah Moroccan tea and with Dilmah peppermint tea. Once done, coat in egg whites, then breadcrumbs and brown. Heat butter in a pan, add garlic and cauliflower. Take off heat once cooked through. Allow to cool and puree in a blender with milk. Glaze pumpkin chunks with melted butter and honey. Bake until golden and sticky. In a stockpot gently fry the onions, celery and tomatoes until lightly browned in colour, stirring continuously. Add the bones and trimmings with water and bring up to a boil, reduce the heat and gently simmer for 4 – 5 hours. Skim off any scum or fat that rises to the surface. Once cooled, pass the stock through a fine sieve and over a moderate heat, slowly reduce the stock. Add flour to gain consistency.